The availability of IP traffic monitoring data is of great importance to network operators, researchers and law enforcement agencies. However, privacy legislation, commercial concerns and their implications constitute an impediment in the exploitation of such data. In order to allow compliance to the derived issues and protect privacy without compromising information usability, this chapter leverages findings from two separate research initiatives and aims at paving the way towards a unified approach for privacy-aware collection, processing and exchange of data that stem from network monitoring activities. 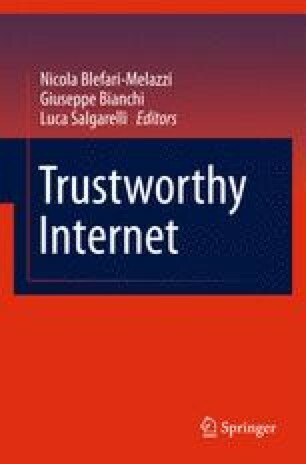 It investigates the fundamental principles and requirements for a privacy-aware ontological model in the semantic domain of monitoring-data management and exchange, as well as a rule-based approach in specifying the appropriate privacy policies, and enables a clean separation between data models and security semantics. It pursues the definition of the appropriate structures for seamlessly introducing privacy awareness in network monitoring ontologies, including user context, intended usage purpose, data age and privacy obligations. Such an approach enables to transfer the expressiveness of legislation rules into the model and allow their automatic processing.